The Witcher 3: Wild Hunt, which is the next installment in the most critically acclaimed and widely recognized open world action role-playing video game series called The Witcher, has expeditiously been building a giant hype around it ever since it was announced early last year. The game looks gorgeous every time its demoed, and CD Projekt Red is trying to keep it that way on both the PlayStation 4 and Xbox One. Keeping console parity in view, it looks like the developer won’t use any special graphical features for the game on both the latest video game consoles. Featuring “a living open-world larger than any other game in modern RPG history,” The Witcher 3: Wild Hunt marks the beginning of the end of the story of Geralt of Rivia, the main protagonist of the game. Packing approximately 50-hour long main storyline gameplay, the game is only being developed for the latest consoles and PC, and not the last-gen consoles as they are not able to handle its graphical fidelity and large, rich open-world environment. In every gameplay demonstration, The Witcher 3 looks more jaw-dropping, and CD Projekt Red is making sure that the game clings to its strong visual appeal on both the latest consoles. But of course, PlayStation 4 and Xbox One have some of their own exclusive hardware features, and the question is that while keeping console parity in view, how will CD Projekt RED take advantage of the PlayStation 4’s unified GDDR5 architecture, and will they come up with some special graphical features that will be exclusive to only one console, such as the PlayStation 4? 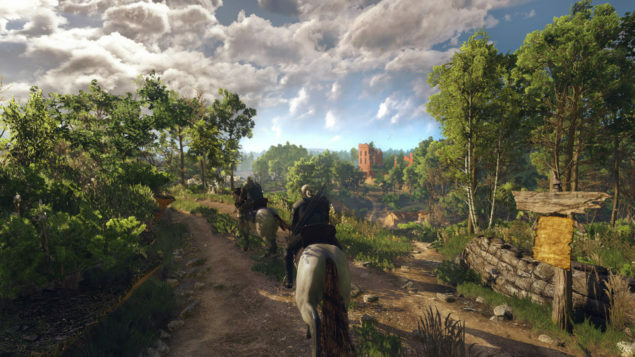 Further talking about the development and how The Witcher 3 will exceed in delivering similar gameplay experience across all platforms, Balazs was asked about the anti-aliasing technology that the development team will use for the PlayStation 4 and Xbox One versions of the game, and he stated that while options are still being explored, it is quite clear that the hardware based MSAA won’t be used. The Witcher 3: Wild Hunt will launch in February 2015 for Microsoft Windows, PlayStation 4 and Xbox One. Stick around for more news on the game.